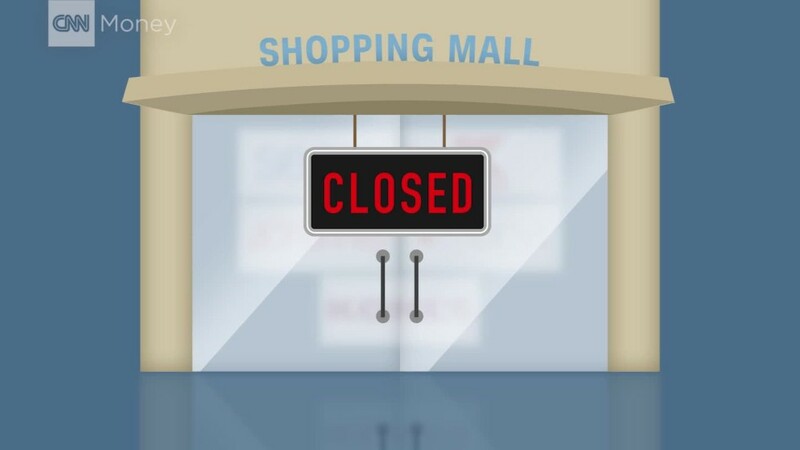 "When anchor stores close, it causes big problems for mall owners and other retailers in the mall," says Howard Davidowitz, chairman of New York-based retail consulting and investment banking firm Davidowitz & Associates. "And I'd say this problem is only in its second inning." Retailers often sign co-tenancy agreements in their leases with malls, allowing them to reduce their rent or get out of a lease if a big store closes. That's because the smaller retailers next to anchor stores no longer benefit from the foot traffic that the major retailers received, according to Garrick Brown, vice president of retail research for Cushman & Wakefield. Brown said he expects the weakest malls to enter "death spirals." Many former anchor tenants are closing hundreds of stores as Amazon (AMZN) eats their lunch. Sears (SHLD), which had operated nearly 3,800 stores as recently as a decade ago is now down to 1,104 stores. Macy's (M) closed 68 stores this year, and JCPenney (JCP) was set to shutter 128. It's not just department stores that have mall owners worried. When Starbucks (SBUX) announced that it was closing its Teavana tea line and wanted to shutter all of its stores, mall operator Simon Property Group (SPG) countered with a lawsuit. Simon cited in part the effect the store closures might have on other mall tenants. Earlier this month, a judge upheld Simons' suit, ordering Teavana to keep 77 of its stores open. Some successful malls may be able to survive if they can convert department stores' spaces into better attractions for consumers. Many big tenants were getting discounted rates on their leases, and malls may be able to charge higher rates to new tenants, according to Brown and Davidowitz. "There will be a new push to get food halls and entertainment in malls, and make it more of an experience that will draw people in," Brown says. However, even if new tenants can pay more for the space, smaller "specialty" stores can still break their leases if an anchor store leaves. It's also unlikely that underperforming malls will be able to attract crowds anyway. Experts classify malls into "A" "B" "C" and "D" grades characterized in part by sales per square footage of the malls. "B" malls and below are going to have a particularly hard time with the financial burden of the changing mall landscape, according to Brown. The retail loan default rate is currently hovering around 5%, but Brown expects that number to triple. And with defaults come bankruptcies -- lots an lots of bankruptcies. More than 300 retailers have already filed for bankruptcy this year. "If that's not an apocalypse then I don't know what is," says Davidowitz.